Most of you know that my sister April also has a blog, and those of you who don't should read it because its awesome! In April's latest post she writes about the Mother's Day Brunch the two of us made for our mom this Sunday. I made a pancetta, goat cheese, and sun dried tomato frittata that was so good and simple and wanted to share the recipe. Preheat oven to 400. In a medium-large oven safe skillet, sauté the onions and pancetta at a medium heat until pancetta is brown and crispy and onions are beginning to caramelize, about 10 minutes. In a large bowl, combine eggs, milk, sun dried tomatoes, goat cheese crumbles, salt, and pepper. Pour the mixture into the skillet over the pancetta and onions. Bake for about 20 minutes or until set. Place the sliced tomatoes on top and broil on high until tomatoes begin to cook and slightly brown, about 3 minutes. 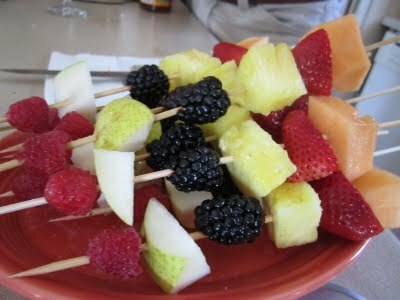 April made these fruit skewers and mimosas to go along with the frittata. We celebrated the day at our lake house, and I gave my mom this bottle of rosé. We have both started to really get into drinking rosé, so I'm excited for mom to try this one and hope she'll share! Keep an eye out for a review of the wine! I'm sure we'll be popping that cork as soon as we can. Thanks so much for this recipe! I saw the picture on Aprils blog, it looks so good! That frittata looks delicious! I hope your mom had a fabulous day--the brunch sounds delicious! P.S. Thanks so much for following my blog! Have a fabulous week!